Weaver Door Bell Hanger | Florida Farm & Feed, Inc.
Weaver Sleigh Bell Door Hanger - 4 Bells. Add just the right accent to your door with this beautiful door hanger. The doubled black leather strap is accented with four bells in 2", 1-7/8", 1-3/4" and 1-5/8" sizes. 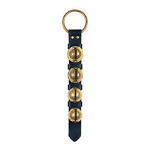 Creased leather edges add a touch of class to the leather strap while a 2-1/2" solid brass ring allows for easy hanging.